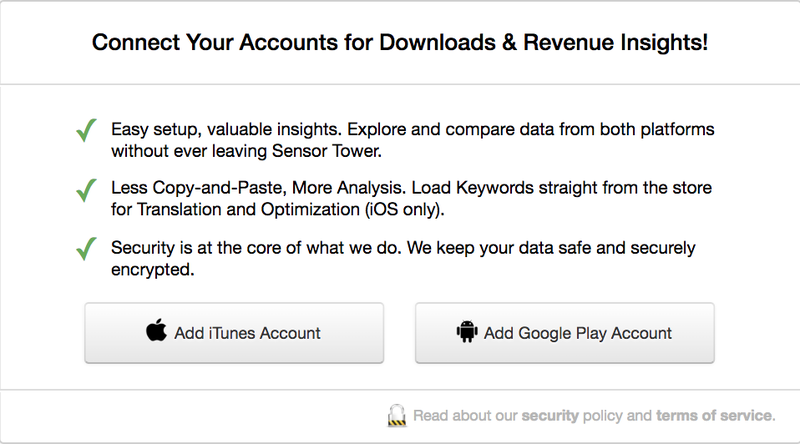 Sensor Tower’s App Intelligence product allows you to connect your iTunes Connect account to the platform so that you can pull in your Sales metrics and other useful metrics to run analytics on. This way you can track how well your apps are doing, all within the same platform. You can then run analytics on this data alongside Sensor Tower’s in an easy to use interface. Follow these steps below to connect your iTunes Connect account. Navigate to either My Sales Metrics or My App Analytics and click on any module underneath them. Enter your Apple ID and your Password of your iTunes Connect account into the fields in the next pop-up. Finally click Add Account. The connection may take up a day to pull in all of the data from your iTunes Connect Account. If you have two-step verification enabled, please disable this process to successfully connect your account. If you have two-factor authentication enabled, please view our help document here on how to connect your iTunes Connect Account. If it does not appear within 48 hours, please contact support@sensortower.com for further help.